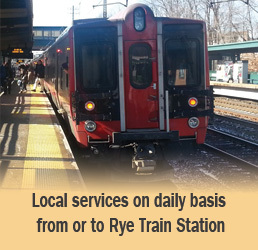 Rye Metro Cab, based out of the Rye Metro North train station, we can respond promptly to your local calls, usually in 15 minutes or less. 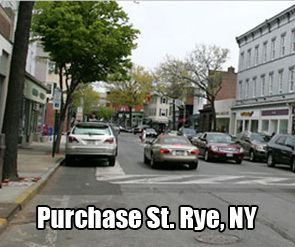 We proudly serve the Rye community and the neighboring areas. Ryebrook, Portchester, Harrison, Purchase, Mamaroneck, White Plains. We offer corporate clients share ride from or to Rye train station, individuals as well as groups, Mastercard, Morgan Stanley, Pepsico, MCI, Nine West Group, Avon, Gabelli, Hotels, Armtrack Stations, Clubs, Playland Park, etc. (914) 967-0058 for additional info, pick up time, location and rates. In town we abide by the city of Rye schedules per city ordenance. Under the guidance and leadership of professionals with over 15 years of experience. Rye Metro Cab & Express Airport Car Service, has been providing outstanding service. Rye Metro Cab is one of the premier car services in Westchester County, NY and Fairfield County, CT.
We are located in Rye, NY. We are just minutes away from John F. Kennedy, La Guardia, Newark Liberty and White Plains Airports as well as from New York City. Our service is professional, dependable and reliable. We specialize in the service to all major airports. Our Town Cars will pick you up from any point of the Tri-State area (NY, NJ, CT) and take you to the airport of your choice. We operate to and from the airports every day, 24 hours a day with reservations. We track arrival flights for delays, early arrivals and flight cancellations. On arriving flights our driver are expected to be at the airport, by the baggage claim area and will be holding a laminated sign which will read Rye Metro Cab welcomes and displaying passanger name. Ask about our express pick-up, it will get you out of the airport faster and it saves the parking fee. When you get your baggage please call at: 877-793-3977 our dispatcher will direct you to the pick up location at the airport, pick up duration is 3-5 minutes after receiving your call. If you need a special request or vehicles for any ocassions, we have suv's, white and black stretch limos, 6, 8, 10 passengers at additional for less than taxi prices ask about it. Thank you for being a loyal airport service customer. In Town we abide by the City of Rye schedules per city ordinance. Copyright 2009 - 2016 © Rye Metro Cab - Taxi and Airport Car Service - All Rights Reserved Affordable airport car service online. Search Engine Submission: www.ryemetrocab.com - Affordable airport car service online in USA.